We’re so excited to share this interview with Mindy Starns Clark on the AmishReader blog today! Mindy is the coauthor of the Women of Lancaster County series, and we’re chatting with her about The Amish Quilter, the latest release in the series. We hope you enjoy learning more about Mindy, this new book, and the Amish culture! AmishReader: Welcome, Mindy! The Amish Quilter focuses on art, especially quilts and paintings. What do most Amish communities think of art? Why is it controversial? Mindy: Many Amish see art as a pursuit that could lead to pride, which they’re careful to guard against. In a culture built around community, individual accomplishment and acclaim is to be avoided whenever possible. 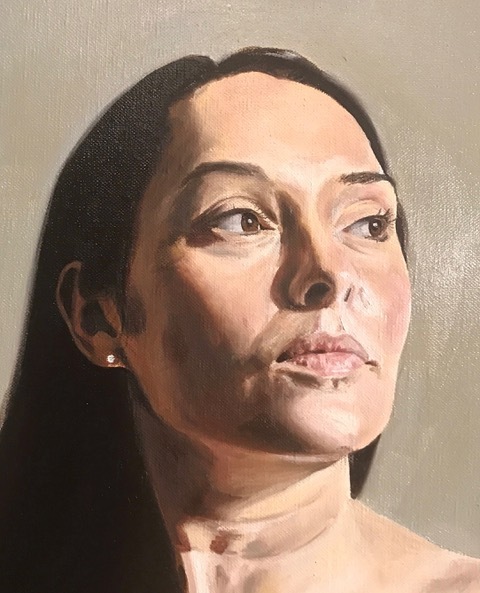 Of course, that varies widely from district to district—including that of a young Amish woman I know in Lancaster County who regularly paints and sells beautiful artwork. When I asked if she had to get special permission to do so, she said no and even seemed surprised at the thought. So, as per usual with the Amish, there is no one hard and fast rule for every district across the board. AmishReader: Do you personally enjoying creating or viewing art? Mindy: Yes, both! I’m not all that good at it, but I really enjoy drawing and painting, and I actually do have one published sketch, the map in Secrets of Harmony Grove. I sent it in with my manuscript, assuming the publisher would have one of their people reconstruct it more artistically, but they ended up using my version instead. So that was fun and very gratifying! I also love flipping through art books and going to art museums. My nephew, Andrew Starns, is an incredible artist, so it’s especially fun to go museum hopping with him. Andrew served as our art expert when we were writing The Amish Quilter, and he patiently answered all of my frantic texts with exactly the info we needed each time. AmishReader: Do you or Leslie quilt? What kind of research did you have to do for that aspect of the novel? Mindy: I believe Leslie quilted some when she was younger. I have not quilted at all, but in the writing of this book I found myself really wanting to try. I even went so far as to buy some batting and a pack of coordinated fabric squares, but once I sat down and got to work, I quickly realized that the best way to learn quilting is not via YouTube videos! I teach myself a lot of things that way, but I think quilting is a skill best learned in person. At least the supplies didn’t go to waste; I do sew, so I ended up using them for a different project. For our story, Leslie took the helm on the quilting research, learning from interviews with quilters and supplementing that with various books and videos. Then, with that knowledge, she laid all of the groundwork for our various quilting scenes. On my end, once I gave up on my own teach-yourself-to-quilt experience, I headed to an Amish quilt shop instead and simply picked the owner’s brain to make sure any quilting stuff I’d added to the manuscript was correct. That quilter was extremely friendly and helpful. 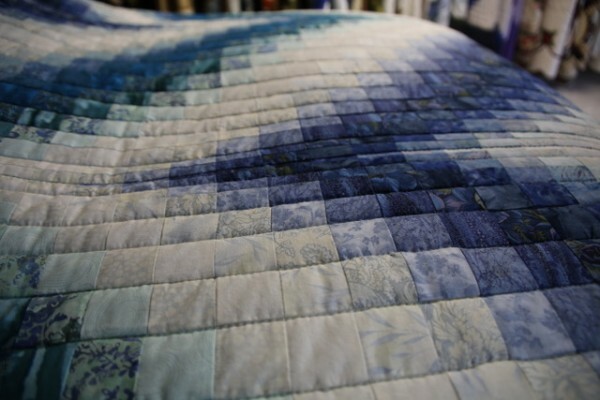 And if I ever find room in the budget for an actual Amish quilt of my own (they run anywhere from $600 to $3000+), I’ll be sure to check hers out first as she had some of the most gorgeous quilts I’ve ever seen. At least I was able to purchase some smaller quilted items, two of which I’ll be giving away on my blog this month. 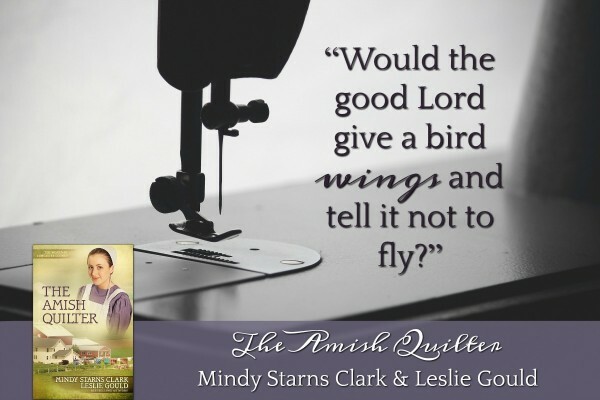 What was the best part about writing The Amish Quilter with Leslie? Mindy: As always, the best part about writing with Leslie is simply getting to spend so much time with her. She’s such a special person and a dear friend. She’s also a tremendously gifted writer and a true pleasure to work with. After eight books, we’ve gotten this thing down to a science, and it’s fun to see what a well-oiled machine we’ve become! Co-writing is such a unique endeavor, one that requires flexibility, ingenuity, compatibility, and much more. It also creates numerous practical and logistical challenges, especially when you live on opposite coasts, as we do. But because we’ve been doing this for so long, we’ve pretty much learned our way around whatever the book-writing process might throw at us. Creating these books with Leslie has been a rewarding process from beginning to end, and I’m deeply pleased with what we’ve managed to accomplish together. AmishReader: Your teamwork and enduring friendship are so admirable! Do you have a favorite line or scene from The Amish Quilter that you can share with us? What makes it especially meaningful to you? That particular passage is meaningful to me because I’ve often said the same thing to aspiring authors who are doubting whether or not God wants them to write. I always respond the same way: If He’s given you the talent and the drive, then why wouldn’t He want you to write? It was fun to express a similar sentiment in this story. AmishReader: Which book in the Women of Lancaster County series was the most fun to write? Which one was the most challenging (or rewarding)? Mindy: The most challenging was probably The Amish Midwife, just because neither of us had ever co-written before and hadn’t a clue how it was done. We also didn’t know each other, so we were having to navigate this complicated process while also learning each other’s styles and rhythms and methods. We managed to figure it out as we went, and our friendship blossomed in the process, but it’s definitely gotten easier with each subsequent book. As for the one that was the most fun, it’s impossible to say because they’ve all been enjoyable in their own ways. The Amish Nanny was fun because our characters got to travel to Europe. The Amish Bride was fun because I loved Ella so much and found her entire tale quite compelling. (It’s my favorite in the series). The Amish Seamstress was fun because I really enjoyed the Amish-and-the-Indians historical elements, something that I’d known nothing about prior to the writing of that book. Finally, The Amish Quilter was fun because the romance between Linda and Isaac was so intricate and satisfying to help construct. If I’m really honest, the most rewarding moments of the entire experience came when The Amish Midwife hit #1 on the bestseller list and then went on to win a Christy Award! Somehow, sharing both of those high points with a co-author made them twice as nice. Which heroine in the series is most like you? First, I’m a lot like Ada Rupp, the main character in The Amish Nanny, just because of her love of travel and adventure and her desire to see the wider world. She’s also very visual, as am I, and she delights in beautiful things, both man-made and in nature. Second, I’d say I’m like Izzy Mueller in The Amish Seamstress, because she’s such an introvert, content to work the hours away in solitude, always feeling when she is in a crowd just a bit like a square peg in a round hole. Mostly, however, what Izzy and I have in common is that we both fell in love with our best friends. When I was in college, my best friend was a guy named John Clark, and we just loved spending time together, hanging out, laughing our heads off, talking for hours, and so on. Then one day, after we’d known each other for more than four years, I realized to my astonishment that I was in love with him. (I also realized that he loved me too, he just didn’t know it yet!) So, like Izzy, I bided my time until he came to his senses—and the rest is history. We’ve been married for almost 30 years now, and he’s still my best friend and favorite person in the whole world. AmishReader: What a sweet love story, and how perfect to end our interview with a true happily-ever-after! Thank you so much for joining us today, Mindy. 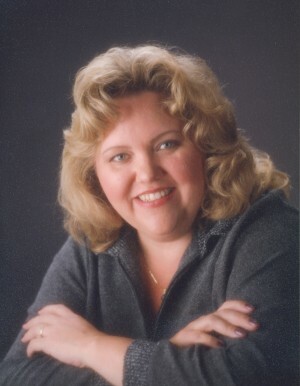 Mindy Starns Clark is a bestselling and award-winning author of both fiction and nonfiction, with over a million books sold. Mindy and her husband, John, have two adult children and live in Pennsylvania. Visit her online at MindyStarnsClark.com. Eager to read The Amish Quilter? You can pick up a copy today through your favorite bookseller, such as Amazon.com, BarnesandNoble.com, or Christianbook.com! I would love to win a copy of this book, it’s been on my wish list since I first saw it, and the quilt would be a wonderful bonus. Thank you for hosting this giveaway. Hi, Wendy! We’re so glad you’re excited about The Amish Quilter. If you’re looking to enter the book and quilt giveaway we’re hosting, you’ll find the form in this post → http://www.amishreader.com/2018/05/01/amish-quilter-giveaway-win-quilt-books/ Mindy is also hosting a giveaway with quilted pieces (an apron and potholder) on her own blog. You can learn more here → http://mindystarnsclark.blogspot.com/2018/05/faqs-and-giveaway-for-amish-quilter.html Thank you for your interest! I enjoyed learning more of the process of how two authors work together. It’s like the best of two worlds taking the best or talents of what one great author knows about or researches and putting it together with that of another great author. All I know is the results are AMAZING! Mindy’s nephew, Andrew, is VERY talented. I don’t have whatever it takes to sew a quilt either it seems. My Mom did but it just didn’t stick with me it seems. I have some quilts that my Granny did that are treasures to me. I, too, found out that deep friendship can turn into love as it did for my husband and I. He is still my best friend and we celebrate 35 years of married life on July 1st. I can’t wait for the opportunity to read “The Amish Quilter”. Love your responses, Kay! That’s wonderful you have some quilts from your grandma that you cherish…and even more wonderful that you’re married to your best friend. Congratulations on your upcoming anniversary! I can’t wait to read The Amish Quilter and would love to win a copy. Thank you for the opportunity to enter this giveaway. I have all of the other Women of Lancaster series plus the Shadows of Lancaster County and Secrets of Harmony Grove, and they are some of my most favorite books. I love quilts, but have quilted only a table runner; but both of my grandmother’s quilted and since I was the only grand-daughter for one, received all of her quilts when she died. They are so precious to me and I use them. So glad you’re excited about this book, Meg! 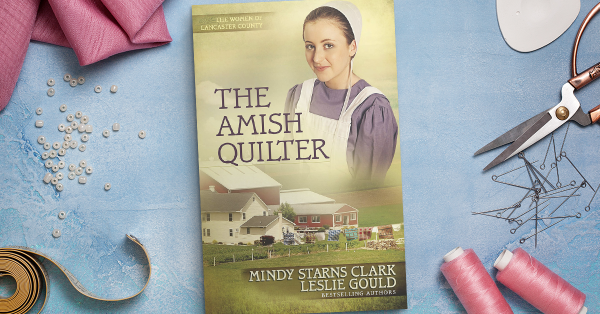 You can learn more about our giveaway and enter to win at this link → http://www.amishreader.com/2018/05/01/amish-quilter-giveaway-win-quilt-books/ That’s so neat how Mindy and Leslie’s books are some of your favorites. And such a precious gift indeed to have your grandmother’s quilts. It’s wonderful you’re putting them to use and cherishing them! I loved the first four books in this series! I’m looking forward to The Amish Quilter. These ladies have such talent to co-write. I’m excited to see the story they cook uop. 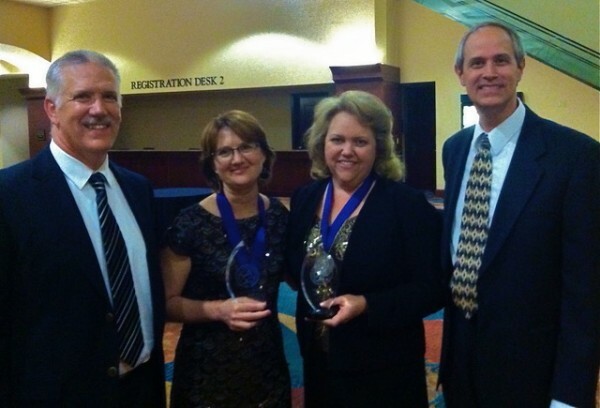 Congrats in the Christiy award – somehow I missed that announcement. That’s awesome you’re a devoted fan of the series! Aren’t Mindy and Leslie so talented? Thank you for visiting and commenting!